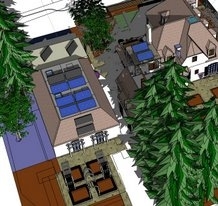 Heat is collected via roof-mounted flat plate solar collectors. 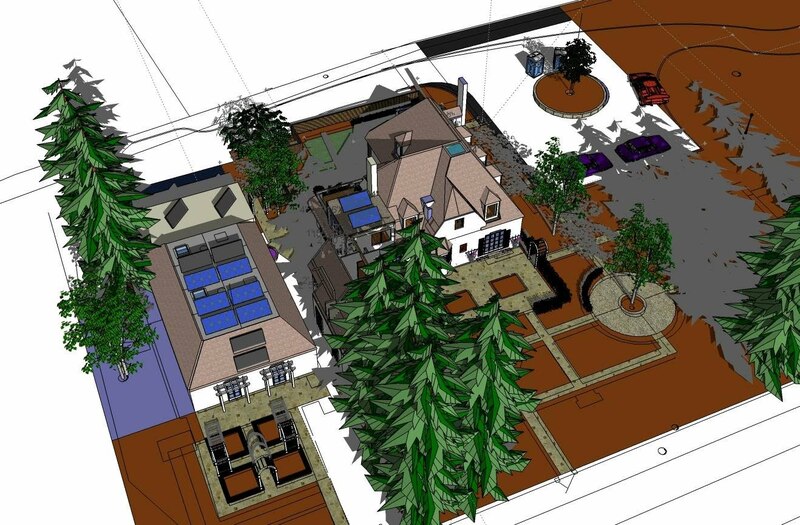 Due to large trees on the property, the best performance is obtained by orienting one set of collectors east of south, and another west of south. Four are facing south-west, and two are facing south-east. The solar heat collectors are illuminated as shown in these simulations (solar heat collectors are dark grey). Solar heat collectors are of highest value in the fall and spring, when they provide good heat output and can heat the house. In the middle of winter the heat output is too low (short, cloudier, colder days), and in the summer their heat output is much more than needed. For this reason, only so many heat collectors are cost-effective: additional space should be devoted to solar electric panels, which provide useful energy year round, but they are not as efficient at extracting energy as solar heat collectors. A trade-off between heat collectors and photovoltaic (electric) panels allows picking a good balance of panels. PV panels have a fairly fixed value: each additional panel cost a certain amount and yields a certain amount of payback power (ignoring preferedsizing for inverters). Additional heat panels, however, have decreasing value. 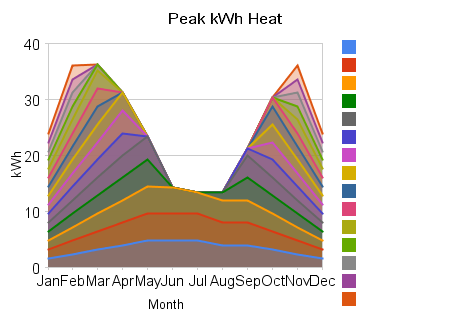 Extra summer heat cannot be sold to a utility. 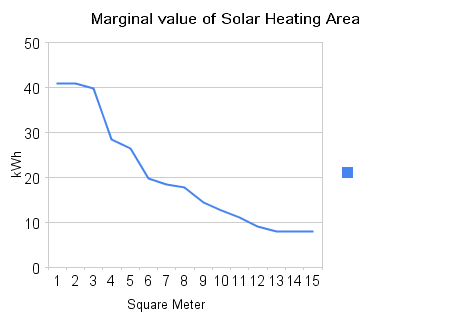 So the right balance for panels occur when the marginal value of a heat panel decreases to that of a PV panel. The following two graphs indicate the marginal value of heat panels, as spread out through the year, and summarized as value per added panel. The primary heating of the house is with RauPanel radiant floors . Radiant floors need water inlet temperature of around 95F (compared with 140F+ for air furnace). Note that it is important which kind of radiant floor to install: the kind with heat spreader plates directly in contact with the finish floor is much more efficient. Energy-efficient heating and cooling by season.